In the Bible, "cedar" is mention 76 times. This strong, fragrant, long-lasting, prized wood came from the trees that were grown in Lebanon. Cedar was used for paneling, columns and beams in palace, temples and other elite buildings in the ancient world. They are slow growing trees and can reach heights of 120 ft. [35 m.] and circumferences of 36 ft. [10 m.]. Cedars were used by Solomon in constructing buildings in Jerusalem and indeed, they were used all over the Near East for the construction of large buildings from ancient to relatively recent times.). For example it is said of Solomon that he "... made silver as common in Jerusalem as stones, and cedar as plentiful as sycamore-fig trees in the Shephelah" (1 Kings 10:27). Today there are only several thousand Cedars of Lebanon in existence. 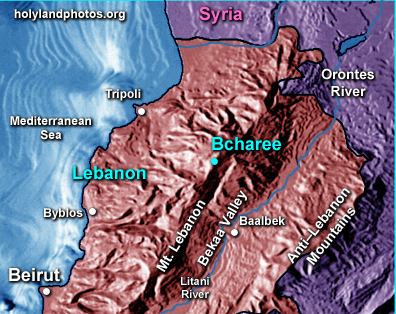 The cedars pictured here are from a grove in the area of the Lebanese village of Bchareé that is located at an elevation of 6,500 ft. [2,000 m.] in Mount Lebanon—about 22 mi. [35 km.] inland from the Mediterranean Sea (about 40 mi. [65 km.] northeast of Beirut). Twenty thousand hectares [49,000 acres) of the area has been declared a UNESCO Biosphere Reserve.